For years, scientists have debated whether plants communicate. They hook electrodes up to their leaves to measure changes in electrical conductivity and then argue about whether those fluctuations constitute “communication”. Hell, they could have just asked me. Plants talk to me all the time. It’s getting them to shut up that’s the problem. I fight the compulsion even though I already know I’m doomed. But I can’t help it. I have to obey. Against my will, my head turns. All sensors lock on. My feet can’t help but follow. And there it is: A plant, seductively waving its vivid greenery, or worse, shamelessly flaunting its magnificent flowers. I try to turn away. I remind myself of all the other plants currently crowding my house, but it doesn’t work. Some people complain about having a black thumb, but I have exactly the opposite problem. I have a green thumb. On steroids. My point is, I know better. And it doesn’t stop me. I stay away from greenhouses, but the big-box stores do me in. They put a display right at the door so I can’t avoid it. The plants’ voices are clear and sweet and utterly irresistible. This week I came home with two orchids from Home Depot (a hardware chain). They were in cute little coloured pots, and they were only $6.50! 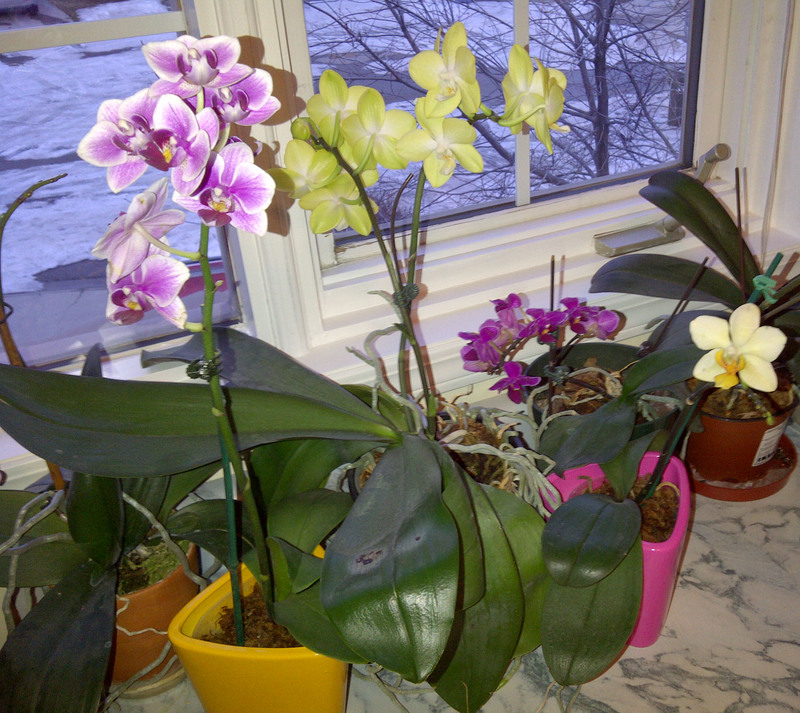 Never mind that I already had four orchids blooming in my office. I didn’t have those particular colours. And they were on sale! Did I mention that? A few months ago I went to IKEA with a very specific list of household items. Got the items. Also got a red anthurium. And a couple of the cutest little palm trees, because apparently I haven’t yet figured out that plants with the word “tree” in their names tend to grow into, well… trees. Before that, it was cyclamens. From Home Depot again. I have to stop going into that place. More to the point, I have to acquire some device that can block the telepathic transmissions of plants. Or else get a frontal lobotomy. But I’d rather have a bottle in front of me. And flowers blooming in my office. But wait – there are the Singing Plants of Damanhur. Oh, look, I’m not the only one who hears the voices! You are definitely not alone! I’ve been gardening since I was 8. Planted iris and cala lilies around the playhouse my dad built for us. From there I went to college in the redwoods and immediately went out on the forest with a borrowed axe to chop off a burl from a tree to put in my dorm room. It goes on from there over 50 years! I work for White Flower Farm.. talk about surrounding yourself with temptation! Oh, that would be a disaster for me! I’d just keep reinvesting my paycheque. When I first got out of college, I worked in a clothing store. I had to quit. I owed more than I was making. Your affection for plants — and your skill at caring for them — are worth celebrating, Diane. There are much worse addictions. And somebody has to make up for the vegetative carnage the rest of us leave behind. So jealous! I wish I had the ability to talk to plants. Then maybe I’d hear them when they’re screaming at me for water, which I tend to forget for weeks on end. Also, the cats have a tendency to chew them to bits so my little palm tree now looks like a stick in the ground. When I walk through a plant nursery, I have an almost overwhelming urge to “rescue” (purchase) all the spindly, twiggy plants I see. Or at least set upright all the knocked-over potted plants, and water the desert-dry ones. Yes, I’ve done this. I’m a sucker for a hard luck plant story. …and they tell those hard-luck stories so eloquently, too. I’m glad I’m not the only one who succumbs! Your only hope is to wrap your head with aluminum foil just before you enter the store. The natural assumption is that the Faraday Cage effect that the metallic wrapping provides blocks the electromagnetic waves radiating from the plants, thereby freeing you from their compellingly seductive emanations. Wrong. It only works because you’ll look so weird that nobody in the store will wait on you. Trust me on this. Been there, etc. The video of the singing plant is amazing! I envy your beautiful orchids. They look so healthy. I just transplanted mine…it looks so pitiful. No blooms yet. But I do hear that they’re tough. P.S. Your orchids are beautiful!! Ah-ha! At last, I’ve found out where we differ. I love looking at other people’s plants, but I don’t have any desire to take care of my own. I’m down to my last two indoor potted plants (I’ve killed all the others; no, not intentionally–I’m not a plant murderer): a philodendron in a bright yellow pottery duck that one of my office mates brought to the hospital when I had my daughter more than a few decades ago (man, those things are hardy!) and a cactus someone gave my husband (it thrives on neglect, unlike my husband). LOL! Oh, sure, foist the guilt off on me. But if you’ve managed to keep the duck-philo alive this long, it’ll be fine… and I love the idea of a bright yellow pottery duck! Holy tropical! Eighty degrees and shorts, wow. I bet you can even grow a bunch of things outdoors that have to be house plants here. I keep wondering if I’d like to live in a warmer climate, but I think I’d miss winter. If I could live in a place with a only a couple of months of snow, that would be ideal. I’m impressed! I gave up having plants. All I have are the fake variety (and tacky ones at that), so I’m always awed by people who make them thrive. The only thing that whispers to me in the store is chocolate. Ah, good point! And it thrives in my belly, so all’s good after all! Plants, like all other forms of life, simply hurl insults at me. Hahahaha! Oh, I shouldn’t laugh at “planticide”, but that’s so funny! We would also like to know if you are receiving some insider information….We are anxiously awaiting some sign to give us hope that Spring is indeed favoring us with it’s warmth soon! Great post! My obsession with gardens has come and gone, but I do “get” you. By the way, do your plants have any insider information about this winter that just won’t quit?